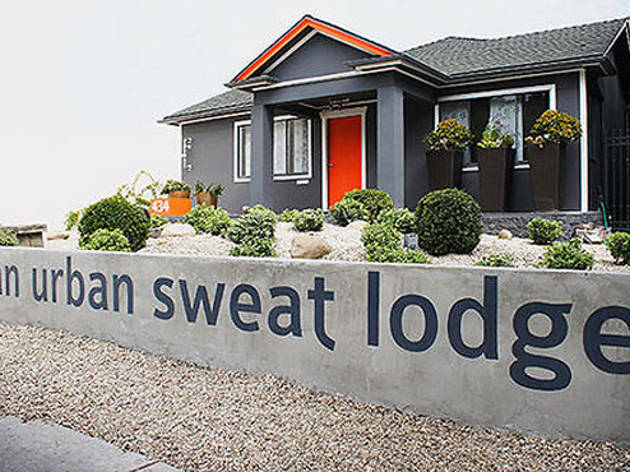 This self-described "urban sweat lodge" is where Angelenos feel the burn—as in infrared—while they unwind. Book a 50-minute session and you'll be set up in one of two dimly-lit rooms where curtains divide individual, spa-style beds (fresh sheets, fully reclining, call button, water-bottle holder). The friendly staff will help you settle in and wrap you in an infrared blanket, as headphones are placed on and a Netflix or Hulu channel found. Several minutes in, you'll feel the heat—and half an hour in, you'll feel warm and toasty. The last ten minutes are bit tough, but the staff is there if you need a cool towel or to unwrap a limb or two. Post "workout," head to the relaxation room where electrolyte-filled water, orange slices and tea await. Expect to be drenched (bring a change of clothes) and free of toxins without having lifted a finger—sure beats going to the gym. Shape House also has locations in Santa Monica (1003 Broadway), Pasadena (1169 S Fair Oaks) and West Hollywood (653 N Robertson). If there is one place I can recommend without hesitation, it is Shape House. I've been going regularly to sweat for more than 1 1/2 years now and it is one luxury I cannot cut out from my life. Although the amenities are very spa like, this is not just a pampering treatment. Each session is almost 55 minutes in an infrared sauna blanket heated to over 165 degrees. 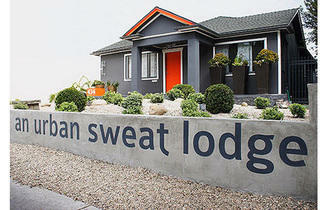 That's why they refer to it as an "urban sweat lodge" vs.a sauna experience. Prior to Shape House, I have regularly gone to spas (mostly Korean) for sauna benefits. Because those saunas are heated rooms, vs. infrared which goes into your body vs. "around" your body) it is not possible to stay in anywhere near this long. And instead of disrobing, you actually need to cover your skin to prevent burning. Appropriate attire is cotton long sleeve tees and sweatpants or long comfortable pants. You wear socks to cover your feet. Your head is out of the heat. And you are given bottles of reverse osmosis water enhanced with minerals.This process is very safe. You get a call button by your bed in case you need assistance or anything goes wrong. Each station has Roku set up so you can watch TV or listen to music, which for me, is instrumental in taking my mind off the heat. It may take some time to build up the tolerance to sweat through these long sessions, but your mind and body will thank you for it. Half way into the session you will feel sweat rolling down your torso until you are drenched. Your heart rate also quickens, as if you are running or doing other intensive cardio. After your session, you are taken to the Relax Room to cool down. There you can listen to soothing music and drink more water or tea with fresh orange slices. The benefits continue several days after the session. For me the best part are the after effects. If you do it often enough, you may experience weight loss (all while lying down and relaxing). Your skin will clear up, visibly. You will sleep better. It helps with aches and pains and just puts you in a very relaxed state of mind. I recommended two friends to Shape House and now all three of us meet there regularly. It is one of the best ways to bond while doing something healthy for ourselves.